Holy Shiitakes! How to Feast on Fungi for Months. Well. The shiitake experiment proved a success. Actually, it was too successful. Our refrigerator overflowed with shiitakes. Bags and bags of shiitakes. With only two of us that eat mushrooms, I feared that my harvest would soon end up in the compost. Peter and I just can't eat three, gallon-sized bags filled with mushrooms that quickly. But after awaiting these babies for more than a year, I refused to trash my prize. Dehydrating mushrooms is ridiculously easy. If you have a dehydrator, it's even easier—because you can plug it in outside and avoid the stench that will permeate your house. I thought the smell of hot peppers dehydrating in the oven was bad...it was nothing compared to shiitakes. With dried shiitakes selling for more than \$18/lb., though, the odor is worth it. If you have a dehydrating setting on your oven, use it. Otherwise, preheat oven to the lowest setting possible. Rinse mushrooms under cool water, making sure to clean between the gills where insects might lurk. Fortunately, our mushrooms were clean. However, if you find gnats or other insects, you can soak the mushrooms in a high saline solution to kill any critters, then rinse again. Pat dry. Remove stems from the shiitakes. The stems are fibrous and tough. You can reserve them to add flavor in soups, if you like—but you really don't want to eat them. Slice mushrooms thinly to speed drying. You can also dry them whole, but expect the process to take much longer for complete drying. Spread sliced mushrooms into a single layer on a cookie sheet. If you are using whole mushrooms, place the mushroom gill-side up. Place mushrooms in oven. If you have a convection oven, you can leave the door closed. Otherwise, crack open the door a bit for air circulation. Using the dehydrating setting, it took approximately 12 hours for the mushrooms to dry completely. Check your mushrooms hourly to ensure that they are drying properly and not burning. When completely dry, the mushrooms will be tough and the gills hard, not spongy. Allow to cool completely before storing. You can store the dried mushrooms for six months in a dark, cool place, or you can freeze the dried mushrooms for a year. I chose to fill canning jars that I stored in our pantry. Drying shiitakes adds convenience to recipes—you'll always have mushrooms on hand when a risotto craving hits. 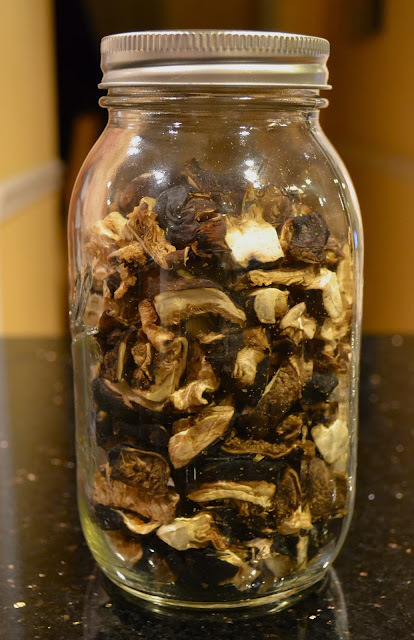 To rehydrate the mushrooms, soak the dried shiitakes in boiling water for 20 minutes or warm water for 30 minutes. Many people use the resulting liquid as a healthy tea. Dehydrated shiitakes can also be added directly to the base when making soup. cure various ailments, including colds, flu, headaches, measles, and nutritional deficiencies, among other illnesses.